Purchase raffle tickets for $500 gift card assortment. Purchase a raffle ticket for your chance to win an assortment of gift cards valued at $500.00! The drawing will be held on October 26, 2018. Purchase raffle tickets for Alex and Ani bracelet. Purchase a raffle ticket for your chance to win this lovely bracelet from Alex and Ani valued at $78.00. The drawing will be held on October 26, 2018. 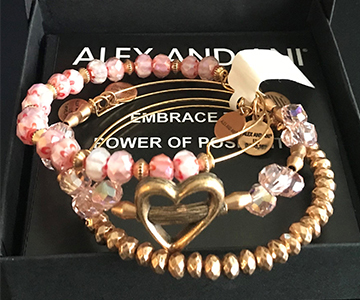 Book of 5 raffle tickets for Alex and Ani bracelet. I would like to make a donation to the luncheon.